It is the joyous festival time of spring in India and people across have begun their Hindu New Year celebrations. The merriment is double, since it is also time for the individuals to observe their beloved Lord Rama’s birth anniversary—the seventh incarnation of Lord Vishnu. According to the Hindu calendar month of Chaitra, this year Ram Navami falls on April 13, however, Vaishnava Rama Navami 2019 will be observed on April 14. On the auspicious occasion, sand artist and Padma Shri awardee, Sudarsan Pattnaik have created a beautiful sand art, sharing his warm greetings and wishes to Lord Rama’s devotees. The sculpture of Lord Rama resting on a beach is striking and the picture shared on Twitter is loved by the followers of Pattnaik. WhatsApp Stickers, SMS, GIF Image Messages, Facebook Photos & Quotes to Send Greetings on Ram Navami. 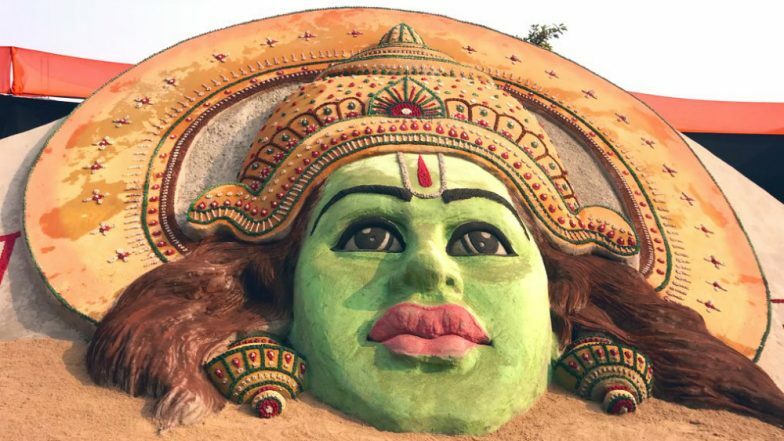 Pattnaik is the most reverent artist in our country, and for sure his mind-blowing skill has only impressed people. Be it the ongoing Lok Sabha elections or the Indian or global festivals; the sand artist never misses an opportunity to showcase and create relevant sculptures by the beach. On the occasion of Rama Navami 2019, Pattnaik once gain is winning hearts on the intern with his sand art of Lord Rama. Ram Navami begins with the offerings of prayers to the sun during the midday, the time when Lord Rama was believed to be born. The day was a big celebration in the royal family of Ayodhya and till today, his birth anniversary is observed with much fervour and enthusiasm. In Rama’s birthplace, devotees take a dip in the sacred river Sarayu and then visit Rama temple.